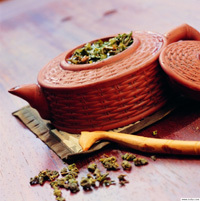 In China, tea is a traditional drink, that's not only good for your health but also can also cultivate your mind. Teahouses become especially popular in the summer, as drinking tea can help you beat the heat. Citylife has some recommendations of good places for tea. Run by two beautiful girls who play the seven-stringed guqin (traditional Chinese zither), this place is elegant and classic. Guests here not only enjoy fragrant tea but also the melodies music of guqin. Moreover, if you are really interested, you can try your hand at having a tea ceremony with other guests. Located in a divine temple, this place will provide you a shelter of serenity. The teahouses here are divided into six private rooms so guests can be fully relaxed in the comfortable environment. The staff are all dressed in traditional clothes of the Qing Dynasty. When savoring a cup of tea, you may feel your troubles have disappeared. Boasting an amazing decor, this teahouse is more like a grand courtyard full of classic style. All the furniture is made from rosewood, which adds a much more traditional atmosphere. It's also famous for its engraved decorations, From the gilded tablets with Chinese characters to jade exhibits, this teahouse provides you an ideal environment for savoring tea. Sometimes, there are folk music concerts which add much more fun to the atmosphere.